A Jewish meat knish (kuh-NISH) is a baked dumpling filled with meat, potatoes, kasha, sauerkraut, onions or cheese (and lately spinach, sweet potatoes and other ingredients), that is traditionally baked but sometimes fried. It's similar to a British pasty, Mexican empanada, Russian pirozhki and an Italian calzone. Since this dough recipe is made with butter, cream cheese and sour cream, and filled with beef, it would not be considered kosher. Read more about knishes here. The recipe for the filling was provided by Lloyd Weinstein of Benjie's Deli in Santa Ana, Calif. The knishes can be individually quick frozen on baking sheets and transferred to freezer bags for storage, if desired. 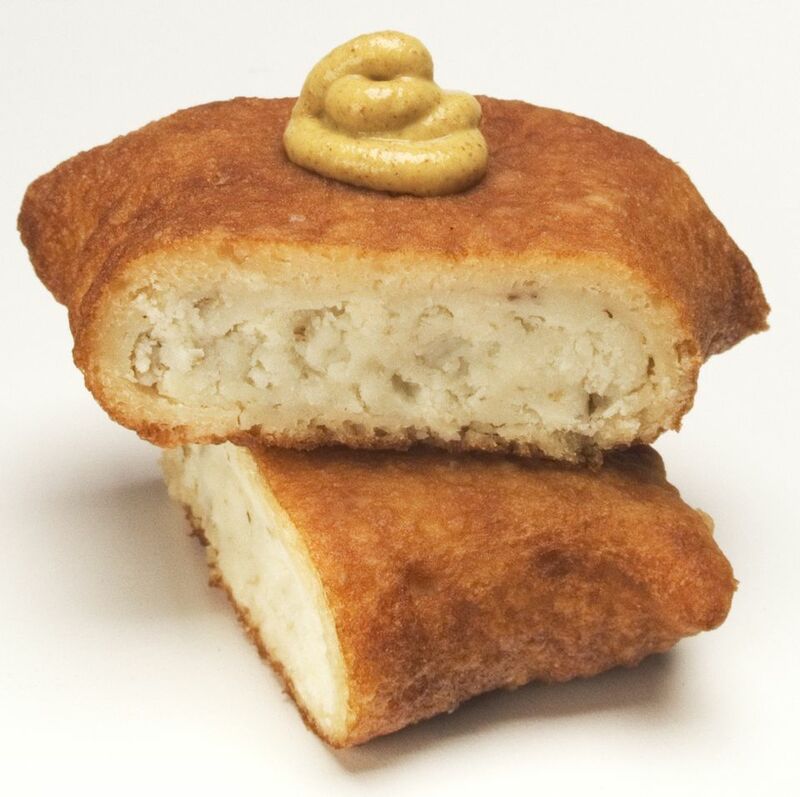 Here is another knish dough recipe you might like to try. Prepare the knish dough in a food processor fitted with a metal blade. Process butter, cream cheese and sour cream until smooth. Add flour and salt and pulse to blend. Turn dough out onto a sheet of plastic wrap. Using floured hands, form into a ball and wrap tightly. Refrigerate at least 2 hours or overnight. Prepare the meat filling by sautéeing the onions in vegetable oil until translucent. Add the ground beef and brown. Add pastrami and mix well. Remove from heat. Pass meat through a grinder with the small hole setting. Transfer meat to a large bowl. Let cool to room temperature. Add eggs and seasonings, and mix well. Flour a work surface and place the dough on it. Cover with plastic wrap and let it rest 15 minutes. Heat oven to 350 degrees. Roll the dough to 1/4-inch thickness. Using a pizza cutter, cut the dough into 3-inch squares. Egg wash the squares with 1 beaten egg mixed with 1 teaspoon water. Place two cookie-size scoops of filling on each square. Then fold the ends in as for an envelope. Place knishes on a parchment-lined baking pan and brush with egg wash. Continue with rest of dough and filling. Bake for 20 minutes or until knishes are golden brown on the top and bottom. Serve warm as an appetizer, side dish or main course.